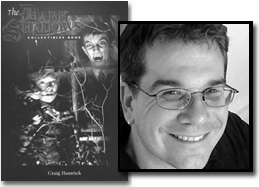 Many issues of 16 Magazine featured coverage of Dark Shadows. The July 1969 issue is a prime example. 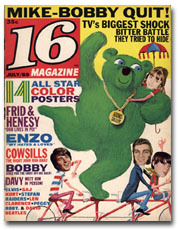 The cover of this classic collectible includes images of Denise Nickerson (presenting a medal to a huge green bear) and David Selby (sharing a bicycle-built-for-four with Bobby Sherman), and a cover line promised readers they'd see Jonathan Frid and David Henesy's lives "in pix." Inside are photos from their scrapbooks, along with some from Denise Nickerson. Just one more flip of the page and we're in the "Dreamsville" section, where fans could make special requests of their idols. 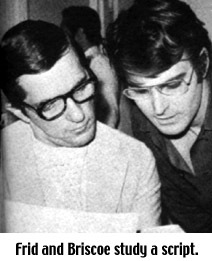 Here, there's a picture of a studious-looking Jonathan Frid looking over a Dark Shadows script with dreamboat Don Briscoe. It seems a young fan named Paitti Dubbs of Altoona, Pa., had written to "16" to say she'd just "die of joy" if she won any kind of Dark Shadows prize. Hopefully she didn't mean it, because she found herself the recipient of several large autographed photos of Frid and Briscoe -- not to mention a script signed by them and several other actors from the show. The editors and actors did this, "just so Patti can prove to any doubters that...'Dreamsville triumphs!'" Near the back of the book, an ad for "16's Teen Star Birthday Book," includes a photo of Jonathan Frid with a word balloon stating, "I'm Sagittarius! Could YOU and I be CLOSE FRIENDS?" I don't get it... Would the typical reader of "16" really want to be "close friends" with a 40-something bachelor actor living in New York City? What would they talk about? On the next page is "My Life in Pix, Chapter One" by Jonathan Frid. 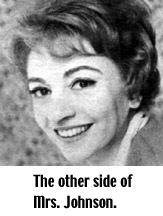 Starting with a picture of Frid at the age of 3, the actor's youth is chronicled in photos and captions. Readers were treated to a rare set of images, including Jonathan in 1945, in the Royal Canadian Navy, and eight years later, in native costume for a televised play based on "20,000 Leagues Under the Sea." 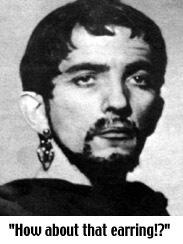 In a 1955 shot of Frid playing Aufidius in Shakespeare's Coriolanus, he's sporting a beard and an early version of those spikey bangs we'd later come to love when he played Barnabas. And in Frid's own words, "How about that earring!?" 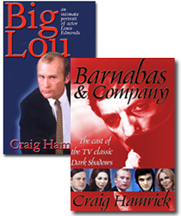 Chapter Two of his life in photographs appeared in the August issue of 16.